Labor, faith and community supporters picket outside Walmart in Brooklyn Center as three associates inside inform their manager they are going on strike. 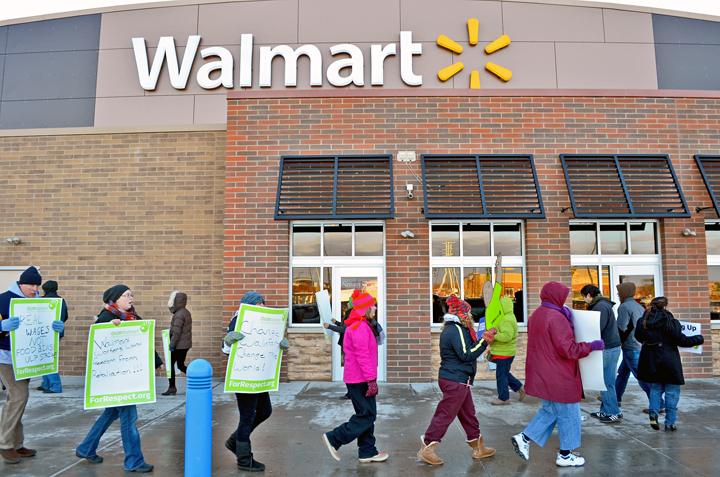 The nationwide wave of Walmart strikes hit Minnesota this morning, when three women who work at the Brooklyn Center store informed management they were going on an unfair-labor-practices strike. U.S. Rep. Keith Ellison and Rev. Doug Mork of nearby Cross of Glory Lutheran Church accompanied the workers into the store, and dozens of supporters from faith, labor and community groups greeted them on their way out, ready to erect a picket line. Andrea Williams, April Williams and Lillian Griffin said they decided to take a stand after attempts to organize for better wages, meaningful benefits and a voice on the job drew retaliation from store managers. 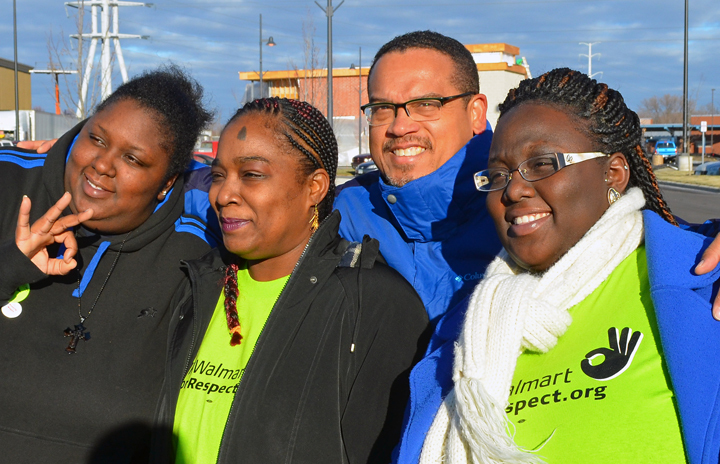 U.S. Rep. Keith Ellison walked out of Walmart alongside three striking Brooklyn Center employees: (L to R) April Williams, Lillian Griffith and Andrea Williams. The three workers are a part of the non-union organizing group OUR Walmart, which is giving voice to Walmart associates and has supported similar short-term, ULP strikes across the country over the last year. The strike kicks off a week of action in the Twin Cities targeting low-wage employers like Walmart. The week will culminate with Black Friday events, including a march to the Midway Walmart in St. Paul. Workers in Miami also went on strike this morning, and Walmart stores in Sacramento, Tampa, Dallas, Chicago, Seattle, Los Angeles and Ohio have seen strikes this month as well. The strikers’ demands – a living wage, full-time scheduling for workers who want it and an end to retaliation – hardly seem like too much to ask from a company that turned a $15.7 billion profit last year. Yet Griffin and Andrea Williams earn just $8.40 per hour, while April Williams, a single mother, earns $9.50. The three women use Walmart’s benefits sparingly – Griffin said she can afford only the company’s vision plan – and rely on public assistance programs like food stamps and Medicaid to meet their needs. A recent report by Minnesotans for a Fair Economy estimated the cost to taxpayers of providing public assistance to Walmart workers statewide at $40.6 million per year. How much of a raise do workers want? “With the money Walmart makes, I think at least $13 per hour,” Andrea Williams said. Ellison agreed, but the DFLer, who represents Minnesota’s 5th Congressional District, said Walmart was not the only employer paying poverty wages. That’s why Congress should act to raise the minimum wage for all workers, he said. “This is not just about this Walmart or this company; this is a low-wage problem that is hurting the whole country,” he said. 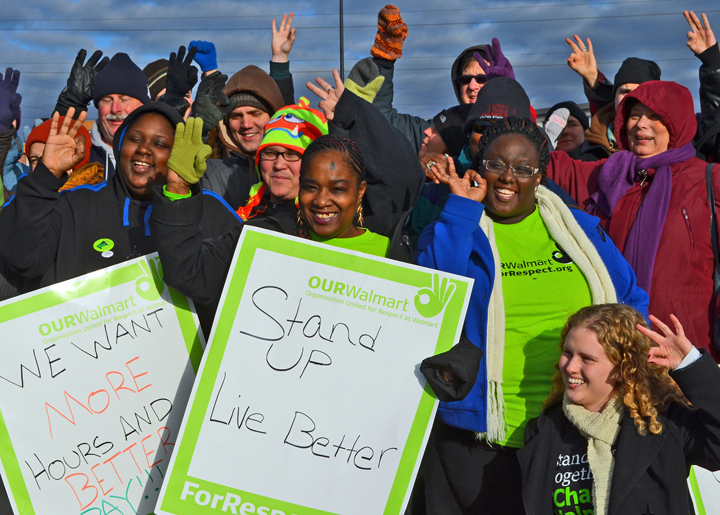 Low-wage employers are the target of a series of events planned this week by OUR Walmart and its allies, including the Minnesota AFL-CIO, the Service Employees International Union, Minnesotans for a Fair Economy and TakeAction Minnesota. A protest Wednesday will call attention to poverty wages paid by customer-service contractors at Minneapolis-St. Paul International Airport, and janitors who clean Target stores in the Twin Cities plan to stage a one-day strike Friday morning downtown Minneapolis. When the week of action concludes with hundreds of people marching to the Midway Walmart, the three striking workers from Brooklyn Center will be leading the way. With support from Ellison and so many community members, the strikers were hopeful they would not face retaliation from management upon their return to work. The Brooklyn Center strike is the first of several actions planned this week targeting low-wage employers like Walmart. Except raising the minimum wage won’t help because then inflation will come into play… So really it does nothing.